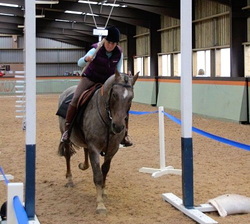 We took Arrayan to Rockrose Equestrian Centre at the beginning of the month for a "have a go at Tilting" day. Good fun and I managed to get a ring ( Look <----- Proof!) Mark got several and everyone enjoyed themselves. Photo with thanks to Angela Fotheringham. Absolutely amazing show of the Northern Lights that lit up the whole stud. Mark has been extremely busy with horses in for breaking and schooling this summer and it has been lovely to have horses back both by Exbury Ghost and Arrayan Numa. Full siblings Chamfron Cactus Jack and Chamfron Angel Dust came for a quick tune up. Will Ramsey's Kitty (by Arrayan Numa) came for seven weeks polo schooling and Chamfron Sakura (pictured) has arrived to be broken in. The photo shows her happily working in open fields, her fifth time ridden. We had a lovely day out with the yearling Chamfron Mojito and his owner Rowena at Strathkelvin show. He took Champion in the foreign and rare breeds ring and was very well behaved on his first outing. Belinni had a trip to the mainland to Romsey show and was second in the world breeds class and best youngster. Chip had an excellent day out at Anglesey show - Going reserve champion in the Foreign Breeds section after winning the in hand four year old and over class and the ridden class. Thanks to Claire for letting us know that Will Ramsey's home bred Arrayan Numa filly won Best Playing Pony at Perth Spring Tournament. We had Lucia here for polo schooling last year and she is the spitting image of her dad. Arrayan has two fillies playing polo and they have both had a BPP already this season. Arrayan also won a BPP at Perth so it is great to see his youngsters are doing the same. The 2015 foals are starting to arrive! Please keep an eye on our blog - Chamfron Stud Blog and our Facebook Page for updates. 2015 Foal page to follow soon - all the foals will be for sale. We are very excited to add the high goal polo pony Morena to our broodmare band. She has played in Sotogrande and in the arena Gold Cup last season. She should breed some exciting polo foals for us. Arrayan's very first foal from a visiting mare is now playing polo and Cath Wilson recently let us know that Alba was awarded Best Playing Pony at Easter Pony Club Polo camp in her first season playing. Chamfron By Dand is being aimed at competitive endurance rides in 2015 and he started the season of well cruising round his first 30Km at the highest speed for his category and gaining a gold award. This also awarded him his first Bronze Thistle Qualifier. … And a week later our very last Exbury Ghost foal Chamfron Nicobar went to join Bombero and Milano with Caroline as well! Chamfron Milano has also been sold to Caroline Clarry in Oxfordshire, the start of a very nice "pink" polo pony string! Two year old Chamfron Bombero has been sold to Caroline Clarry in Oxfordshire, the plan is he will mostly be a polo pony with a little dressage thrown in. Gemma has registered Chamfron Kukri with the BSJA and on his first affiliated outing he won both his classes, his prize money should keep him in carrots for a little while! Chamfron Mojito has gone to live with Rowena Kennedy and we are looking forward to seeing him out showing in the summer. We think he is a fantastic youngster!